This is how all medical practices should work. Our current charitable partner is the Hackett Hemwall Foundation. 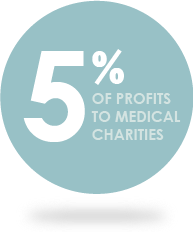 The Hackett Hemwall Foundation provides high-quality medical treatment to people around the world who are otherwise unable to afford medical care. In addition to financial support, Dr. Spartz donates her time and skills to the foundation’s venous disease mission work in Honduras. Through this work Dr. Spartz has seen first hand the destructive power of untreated venous disease. Advanced treatments for venous disease are challenging to obtain in Honduras. The progression of the disease often goes unchecked resulting in large open ulcers that are difficult to treat and heal in the tropical and often unsanitary conditions. Over 1500 patients are treated each week that the Hackett Hemwall Foundation operates the program. Dr Spartz and Spartz Vein Clinic are committed to bringing advanced phlebology treatments to parts of the world where resources for medical care are lacking. We are dedicated to the goals of the Hackett Hemwall Foundation and are proud to support its growth through this monetary support.